Starting out on a Low FODMAP diet can be an overwhelming experience. There are lists of enjoyable and seemingly harmless foods that may now be the root cause of all the evil going on in your gut. Lists don’t seem to have any logic, not to mention label reading and what do you do if you want to go out to eat? 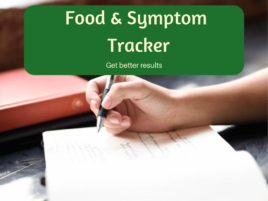 Moving through each of these phases systematically will help you to pinpoint exactly which foods are problematic and how careful you need to be with them. The ultimate goal Low FODMAP Pumpkin Spice Bliss Ballsis for you to have as much variety as possible with a few symptoms as possible. The first and most important step is to take a visit to your doctor. If you are suffering from gastrointestinal symptoms it is important to investigate any “red flags” and exclude any medical nasties like coeliac disease, inflammatory bowel diseases (Crohn’s and Ulcerative Colitis) or certain cancers. Your doctor is the best person to determine which exact tests you need. A specialist Accredited Practicing Dietitian (Australia) or a Registered Dietitian (everywhere else) is invaluable to help you navigate the complexity of a low FODMAP diet. A specialist dietitian can help you identify the foods to avoid or limit as well as help you find foods and recipes that you can eat. A dietitian can also help you to maintain a healthy balanced diet that provides all the nutrients your body needs to stay healthy in the long term. Monash University and FODMAP Friendly have developed Smartphone apps, these provide accurate information and are extremely useful in identifying and selecting suitable food. Label reading is also valuable a skill, it will allow you to identify the hidden FODMAPs in many pre-packaged foods, bakery items, sauces and seasonings. You can download a free label reading guide here. ​If you don’t have access to a FODMAP trained Dietitian, or just want some extra support to ensure you are doing it right, you can download the Ultimate Guide to the Low FODMAP Diet. 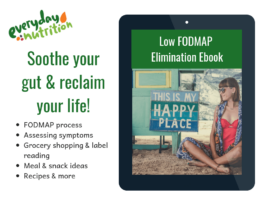 This ebook covers everything you need to know to do the low FODMAP diet. 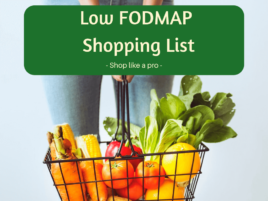 It includes the essential background you need to know before getting started, shopping tips, label reading tips, meal and snack ideas as well as exclusive recipes from FODMAP experts around the world. FODMAPs: Your dietitian and the resources above will help you identify which foods you are eating regularly contain FODMAPS and what foods are suitable replacements for them. Non FODMAP gut irritants: Caffeine, alcohol, carbonated drinks and spicy foods do not contain FODMAPs. However, they are known gut irritants that can stimulate the colon, making your symptoms worse. It is recommended to reduce these during both the low FODMAP phase and the phase and the Re-challenge phase. Fibre: This can be difficult to get on a low FODMAP diet and is the reason why its not recommend to stay on Phase one of the diet long term. Research tells us to maintain a healthy and divers gut microbiome its important to move on to phase two and three of the low FODMAP diet. Some people also have trouble with constipation during this phase. If this happens to you, increase your high fibre, low FODMAP foods such as psyllium husk, oats, oat bran, spelt sourdough bread, buckwheat, quinoa, carrots, kiwifruit, raspberries and other low FODMAP fruits and vegetables. It is important whenever you increase your fibre intake to also increase your fluid intake. There are more tips on managing constipation here. Stress, the speed of eating, talking while eating and meal size can all impact IBS. Small regular meals are usually better tolerated, as is eating slowly in a relaxed environment. Exercise, relaxation or meditation techniques have been shown to make a noticeable a difference for most people who suffer from IBS.